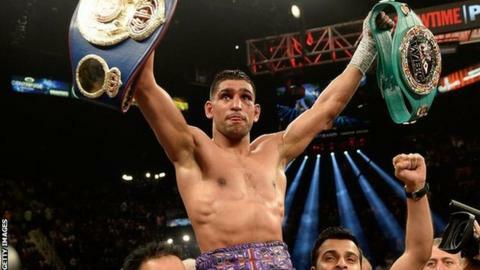 Amir Khan hopes he may finally be in line for a dream fight with American legend Floyd Mayweather after returning to the ring with an emphatic win. The 27-year-old, from Bolton, easily outpointed Luis Collazo in Las Vegas and still has sights firmly set on the undefeated world champion. "Definitely, people want to see that fight between me and Floyd," Khan said. "He's fighting guys who are strong, but styles make fights, and my style would cause Floyd a lot of trouble." Khan, fighting for the first time after a 13-month lay-off, knocked Collazo down three times in the non-title bout. He believes the time is right to face Mayweather, 37, who beat Marcos Maidana on points on the same MGM Grand card to unify the WBA and WBC welterweight belts. "He is getting older and showing a lot of mistakes that he didn't used to do," Khan added. "It is a great time to catch him. "Floyd looks beatable. A lot of people want the fight now because they want a young lion to come up and they want to see him get beat. The only person who has the chance to do that is me. "I'm very, very close to the Mayweather fight. The fight will happen because the public will demand this fight." Khan had been in contention to fight Mayweather on Saturday, but the American opted to take on Maidana despite Khan topping an online poll to choose the opponent. And his hopes of pinning down the lucrative bout any time soon appeared to take another hit when Mayweather shook hands with Maidana's trainer Robert Garcia in the immediate aftermath of the fight and promised a rematch. "If the fans want to see it again, we'll do it again," Mayweather said. A fight with Khan is, therefore, unlikely to happen in 2014 as Mayweather's next available slot, in September, is too close to the Muslim fasting period of Ramadan for the English boxer.